Beautiful inside and out! 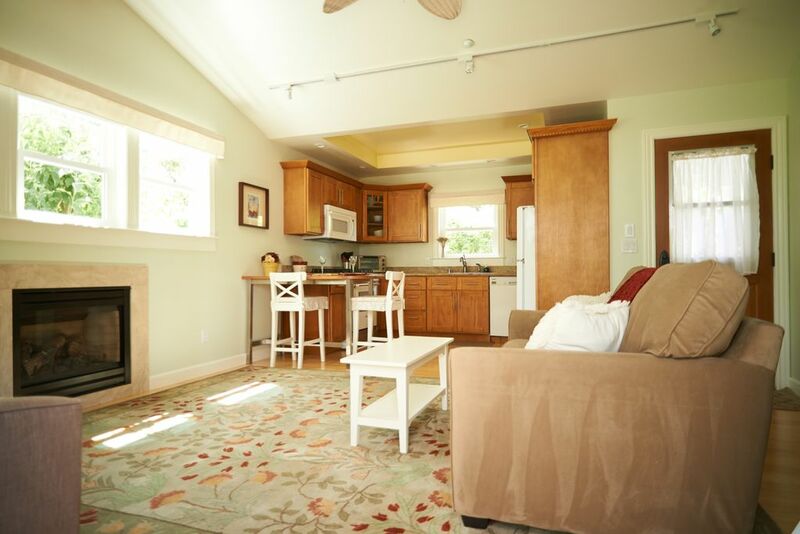 This sunny, garden guest house is an upscale vacation property -- nothing old or funky about it; modern construction, with high quality appliances and fixtures (built in 2012). It is situated on a large, flat, sunny lot landscaped with gardens and patios to feel like a resort. The Honey Bee was designed with privacy in mind -- from both the main house and the neighbors, and has its own private patio with furniture and a bbq. Built to code, including a fire suppression sprinkler system. The furnishings were purchased new, and the art is locally sourced. You'll love the high ceilings, fireplace, granite counters, and natural light, -- a generous 650 sq. ft. with lots of closet space. It even has it's own laundry area, as well as off-street parking. You won't want to leave. Please check out our reviews; we get wonderful 5-star feedback about both the guest house and the gardens. Even if you are visiting on business, you can feel like you are on vacation. The quaint village of Fairfax is lively, with one main intersection, lots of great places to eat (Brew Pubs, Indian, Thai, Mexican, Italian, Japanese, Health Food and more), a 6-screen movie theater, several live-music clubs/bars, multiple coffee houses and bike shops, grocery stores, a weekly farmer’s market, several yoga studios, and a large new, upscale health food store. The town is surrounded by nature and miles of hiking and biking trails on and around Mt. 'Tam' (the birth place of mountain biking over 30 years ago). Centrally located in sunny Marin County's best weather area, Fairfax is a destination in it's own right. And it offers easy access to the entire Bay Area -- San Francisco (by car, bus, or ferry), 'the Bay,' Mount Tamalpais State Park, Golden Gate National Recreation Area, West Marin and Point Reyes National Seashore, the Pacific Coast beaches at Stinson Beach, Muir Beach, or Bolinas, and the world-famous Napa/Sonoma Wine Country. And don't forget the other charming towns in Marin, including Sausalito, Mill Valley, San Anselmo, Larkspur and San Rafael. The sunny mild weather (Fairfax was originally a community of summer homes for people from San Francisco) and walking distance to downtown Fairfax. The large, private, flat lot. The quiet neighborhood with large trees. The friendly community vibe. Claw-foot tub with shower. Celing light fixture has built in heater, vent fan, and night light. Blow dryer, soap, shampoo, conditioner provided. Close in neighborhood of quaint marin county village. Walking distance to downtown. Bosch dual fuel range (gas burners with electric convection oven). Bosch dual fuel range with electric convection oven. Salt, pepper, some spices and cooking oil. Expanded cable package including On Demand. Connect your device to the bluetooth speaker. A small selection of quality fiction. Flowering gardens, lawns, and patios. 12,000 sq. ft. lot full landscaped. Private patio with furniture and gas grill. -Check-in as early as 12 noon, and check-out as late as 3 pm if another renter is not departing on your arrival date, or arriving on your departure date. Otherwise 3 pm check-in and/or 11 am check-out, to allow time for the cleaning. -High Ceilings. -Ceiling fans in Living Room and Bedroom. Portable Swamp Cooler and 2 Dyson bladeless portable fans. Building is well insulated. -Private patio in sunny, garden setting. Honey bees, butterflies, birds and lots of flowers. -Claw foot tub -Original working hand operated pump in the fig garden. - 2 and 1 night stays okay if short notice or fills a 2 or 1 night gap in the reservation calendar. Otherwise, 3-night minimum. Beautiful cottage, great yard, and walking distance from downtown in a peaceful and beautiful setting. I will definitely look to stay here again when in the area. Amanda was very responsive and incredibly accomodating. 1000 thanks! We (couple with a 10 months old baby) really enjoyed staying at Amanda's cottage in Fairfax. The cottage has everything you need with a family with one small child and although it's situated just behind the main house, we had a lot of privacy. Fairfax is a nice village with sufficient facilities (restaurants, supermarkets, gas stations and even a movie theater!). We used Fairfax as a basis for visiting the following highlights in the area (max. 1 hr. drive): Point Reyes, Muir Woods and San Francisco city. We totally recommend the cottage!! The owner is a lovely person. Great experience. Will book it again! This is such cute place, and very spacious for two people. It had a full kitchen with every single appliance you would ever need. The fireplace was really nice to have in the evenings to snuggle by. The bed was very comfortable. The property is really well landscaped, and there were nice areas to sit outside to enjoy the sun. The cottage is very close to downtown, a short drive or a 5-10 minute walk. I will definitely stay here again! An absolutely beautiful oasis in Fairfax convenient to everthing. Amanda has thought of everything to make your stay seem like you are HOME!!! The Bay Area has it all!!! Fairfax is a destination in its own right (with great weather), and also an excellent home base for visiting and vacationing in the Bay Area. Enjoy SF culture, natural beauty galore, the Bay and Ocean, explore Marin, and tour the Wine Country -- or stay 'home' and nap on the garden patio. -2 and 1 night stays okay if short notice or fills a gap in the reservation calendar. Otherwise, 3-night minimum. -Check-in as early as noon and check-out as late as 3 pm if another renter is not departing on your arrival day, or arriving on your departure day. Otherwise, check-in is 11 am and/or check-out is 3 pm, to allow time for cleaning. -Reduced rate for month of Feb. = $4000. -3 person maximum. -The main house is $2500/wk., $7200/mo. (see last photo) CANCELLATION POLICY: If you cancel more than 30 days in advance I refund 100%. (If I’m able to re-book all your dates I don’t charge the cancellation fee.) If you cancel 30 to 15 days in advance, I refund for the dates I am able to re-book, or 50%, whichever is more. Less than 2 weeks in advance, I refund based on the number of nights I’m able re-book your reserved dates. Of course the $50 cleaning fee and the $250 damage deposit is fully refundable no matter when you cancel.